I've been told that 'chao shou' in Shicuan dialect means 'folded arms', this refers to square wonton wrapper folded into 2 points, one crossed over the other. 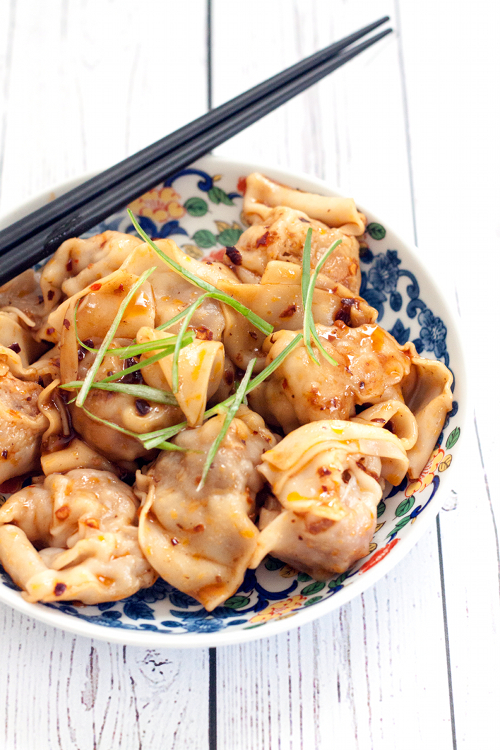 Any way you fold the wontons, this xiao chi (little dish) packs a lot of flavors. 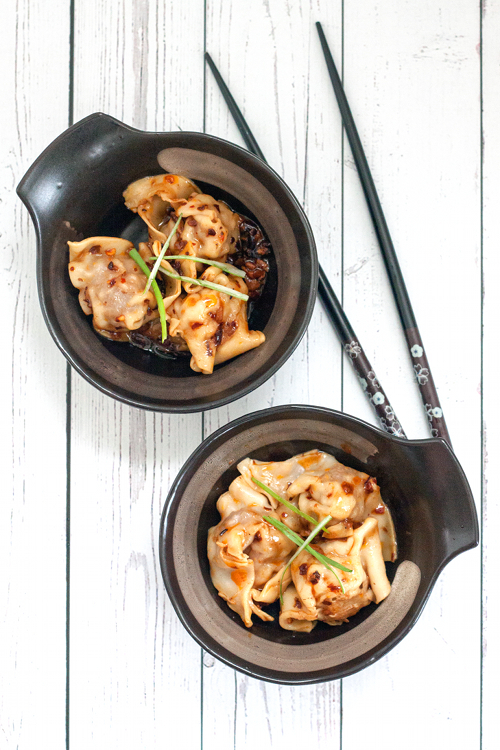 Savory pork filled dumpling are boiled, then mixed with spicy tangy sauce. 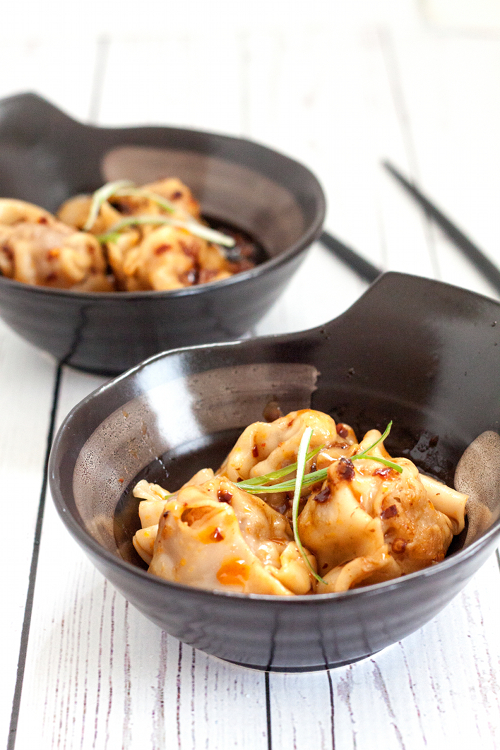 Serve as appetizer or snack in small portions, about 4-5 wontons per plate. In a large bowl, mix pork, egg, ginger, half of minced garlic, rice wine, sesame oil, chicken bouillon, salt and pepper until well blended. 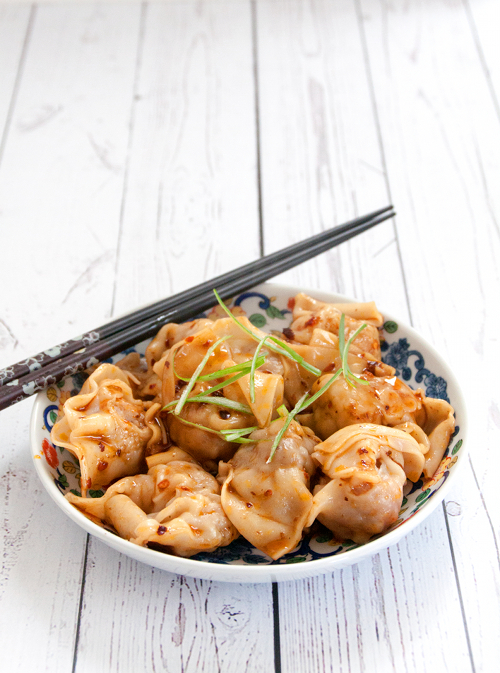 Lay out one wonton wrapper on a plate, place one heaping teaspoon of pork filling in the center of the wrapper. Brush the edges with water, fold the wrapper diagonally so it forms a triangle. Take 2 opposite corner and overlap each other, using a little bit of water to help them adhere. Place wonton on a lightly floured cookie sheet, repeat the process with the remaining wrappers and pork filling. In a mixing bowl, combine chili oil, soy sauce, black vinegar, and the remaining of minced garlic. Set aside. Bring salted water to boil in a large pot. Working in batch, boil wontons for about 5 minutes, or until the wontons are cooked through and start floating to the surface. Transfer wontons to a large strainer to drain. Add wontons to chili sauce and mix thoroughly. Sprinkle with chopped onion and serve immediately. What an authentic and delicious sichuan snack! This looks delicious! I've never tried mixing bouillon in with the meat - what a great flavor-boosting trick!